Much is written about the Montessori Method as it applies to children. But what about parents? How is your role different as a Montessori parent? 1. Nursery schools cater to parents. Montessori schools focus on your child. 2. When you drop your child off at Montessori school, you will be expected to be as inobtrusive as possible. This is not because we do not like you or want to avoid you! It is because we need to create an ideal child-focused learning environment. We hold one-on-one parent meetings and host pot-luck dinners for parent-teacher interaction. It is great if parents enjoy socializing with one another, but please try to move away from the playground or door to the classroom, preferably to a nearby coffee shop, when you do get together. It is very distracting to children to see or hear their parents nearby when class begins. 3. Please schedule a time to talk to teachers or the administration. If you can email or leave a voice mail, we will be every so grateful. Drop off and pick up times can be challenging for young children and our priority will be taking care of the children. 4. If you would like to observe a class, we will be glad to accommodate you, but it might take some scheduling if we are starting a new class or have a number of new students to help acclimate. Montessori Sensorial work includes lovely Color Tablets that are ideal for introducing children to the concept and names of colors. But if your child is young enough so that he or she still prefers to bite and touch objects instead of showing an interest in handling them delicately, wait for a bit and introduce naming exercises with objects that he or she can touch and bite such as a bright red apple, a bunch of purple grapes, or the peeling of an orange tangerine. You can prepare a bunch of purple grapes and a bunch of green grapes for your child's exploration and enjoyment to introduce the name of the fruit and the two colors. Next, prepare three-part cards using these same fruits and vegetables! Montessori curriculum for infants and toddlers in our Montessori teaching albums. If you are using Montessori at home, remember to create a special room or space in your home for the classroom, even if your child is still quite young. This delineation of space allows your child to enter his or her unique learning environment complete with child-sized material, shelves, and projects. Parents who are using our teaching albums: Refer to the Learning Environment section in your binder. Try taking photos of your home environment before and after you implement the changes we suggest for creating a child-friendly and touch-friendly environment. 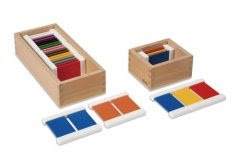 Learn more about our Montessori teaching albums to use at home. A teacher friend says that one spot is left in her adorable local Montessori school in Baltimore, Maryland. Ask for Sue and tell her we sent you. 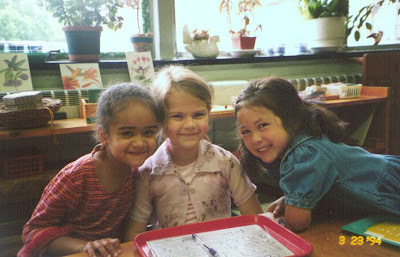 This original photo from Maria Montessori's classroom is from The Montessori Method online. I love this photo because the children look so relaxed in the garden setting! A parent just wrote to ask about the "Primary" class designation. In the Montessori system, we use "Primary Class" for children in the preschool to Kindergarten years -- ages three to six. Here is our Montessori teaching curriculum for the Primary Class.